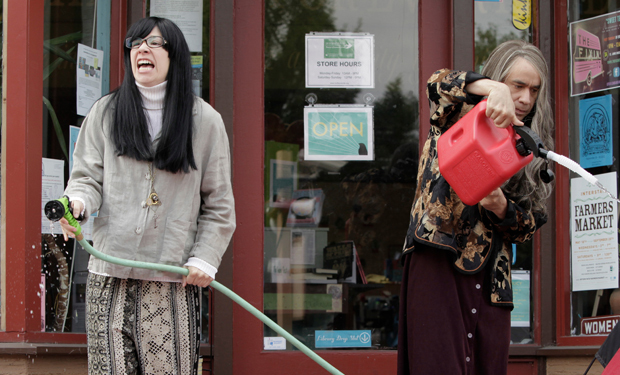 The final season of Portlandia starts this week and from the anxiety-provoking “Did You Read It?” sketch to the recurring feminist bookstore segments (RIP Women and Women First), the show is steeped in literary references and a culture of book worm-ery. 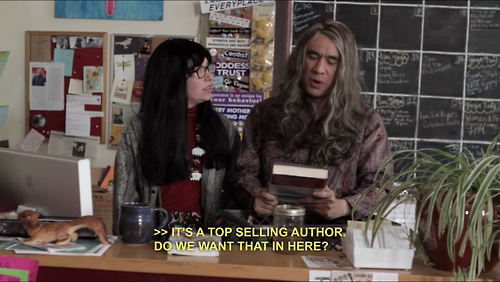 Today, we’re showcasing the fictional literary references in the show – books that the writers room at Portlandia created just for us. Zip up your fleece and hop on your bike. Because we’re heading to Portland. Subtitled “Top Selling Author,” The New Girl Order puts Women and Women First bookstore owners Toni and Candace in a sticky situation. In their world, Stacia Muse is a writer to admire. But are well known books part of Women and Women First’s brand. “She’s a top selling author,” Toni says, pointing at the subtitle. “Do we want that in here?” Candace replies right away. “No. We want bottom selling authors.” And they’re serious about that mission. We’ll never truly know what The New Girl Order contains, but one thing’s for certain: it won’t be on Women and Women First’s shelves. It’s only natural for new parents to turn to books as they seek to understand their child. When Holly and Ryan’s baby won’t sleep, they turn to Cry it Out and Other Ways to Ignore Your Child. The book encourages parents to foster independence by avoiding eye contact and providing a solitary environment for the child. As her baby cries, Holly covers her eyes with the book and gives the method the old college try. But after a few reassuring “We’re right here”s and a halfhearted attempt at peek-a-boo, Holly and Ryan seek out another parenting book – one that’s a little less cold. When the air conditioner breaks at Women and Women First, Toni and Candace attempt to educate the aging repairman who comes to fix the unit. Bryan – who refers to himself as Bryan The Air Conditioner Repairman – makes the mistake of calling Candace “sweetie” and almost immediately the bookstore owners offer up some book recommendations. Toni’s pick is A Bunny’s Tale by Kat Isom, which she describes as “a vivid vivid description of what it’s like to be a woman.” To be a reader in that universe! When Candace and Toni decide to host a reading at the bookstore, they invite Neolfar Jamshidi (played by the stunning Iranian-American actress Shohreh Aghdashloo) to promote her book A Stone’s Throw Away from Freedom. (We’ll overlook the fact that Jamshidi is billed as a Best-Selling Author. Women and Women First must have changed their policy on that front.) Candace and Toni are in awe of Jamshidi and have a million questions about the process. Only their questions aren’t about the process. Not really. “You know where you’re at that place in your writing,” Toni begins, “where the character arc has gone up and down and the narrative arc has circled the planet and back, and then you just need to print it?” After a painful silence, Candace chimes in. “How do you print the first page?” Her answer is just incredible. In another attempt to connect with their child, Holly and Ryan read Le Livre De Bebe Francias and decide only to speak French around their toddler. It’s an experiment that includes a beret, a heavy French noir accent, and an incessant bouncing pink ball. Their child appears nonplussed. C’est va.